Political unrest in Bahrain in February and March may have cost the economy as much as $2 billion. Essam Fakhro, chairman of the Bahrain Chamber of Commerce, says the political unrest that erupted in February and March cost the economy as much as $2 billion. The unrest, which left more than 30 people dead, was initially aimed at achieving greater political freedom and equality for the country’s majority Shia population. Troops from the Gulf Cooperation Council were called in on March 14, and the next day security forces violently confronted protesters at the Pearl Roundabout, near the financial and diplomatic district of Manama. The unrest forced the cancellation in June of a Formula One Grand Prix race, and there likely will be no European Tour golf event in Bahrain early next year. Bahrain’s GDP declined 1.4% in first quarter this year over the last quarter of 2010. Bahrain hosts the US Navy’s Fifth Fleet and is crucial to US attempts to curb Iranian military power in the region. Meanwhile, Egypt’s political turmoil did not have an impact on Suez Canal revenues, which reached a record $5.1 billion in the fiscal year ended June 30. Crossing fees are paid in foreign currencies and all revenues are deposited daily in the Central Bank of Egypt. Canal revenues, tourism and overseas remittances are major components of Egypt’s foreign currency reserves. In Saudi Arabia, prince Alwaleed bin Talal’s Kingdom Holding investment firm signed a $1.2 billion deal with the Saudi Binladen Group to build the world’s tallest building, eclipsing Dubai’s Burj Khalifa. Kingdom Tower, to be built in northern Jeddah, will be part of the $20 billion Kingdom City project, which will include a shopping mall, hotels and a waterfront promenade. Back in Dubai, Abdullah Mohammed Saleh, chairman of the Dubai Financial Services Authority, was named governor of the Dubai International Financial Centre. 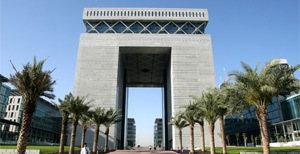 Sixty-four companies joined the DIFC in the first half of 2011, bringing the total to 813. Saleh is former chairman of National Bank of Dubai, which merged with Emirates Bank International in 2007. He is replacing Ahmed bin Humaid Al Tayer as DIFC governor. Al Tayer was replaced as chairman of NBD in June by Sheikh Ahmed bin Saeed Al Maktoum, chairman of Emirates airline and uncle of Dubai’s ruler.